The topic of tolerance is a significant issue in today’s world. 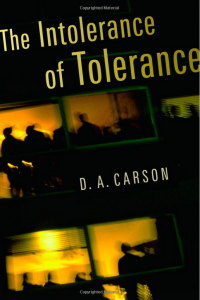 Carson here provides a very helpful introduction into the discussion, a helpful critique of the “new tolerance,” and a Christian way forward. The basic idea is that what used to be tolerance was simply acknowledging someone else’s right to different beliefs or practices. The new tolerance now demands that one accept different views as equally valid. The change from acknowledging the existence of different views to accepting different views is significant. Carson shows how this is not just a change in definition or even faulty logic. This redefinition is essentially forcing a particular worldview on everyone. Carson shows how this forces a certain view of truth, morality, and government upon everyone. In the name of tolerance, the new tolerance becomes tyranny. I recommend the book not only for what it exposes to be incorrect but also for what Carson suggests as the way forward. For a Christian the way forward is not simply inserting American political conservatism, but inserting a Christian worldview on truth, morality, and government.